You know it's going to get good when five-year-old pictures get posted. When I think of Halloween memories, I tend to travel back pretty far. I smile when I remember my costumes (and the fact that these costumes may have extended a little too far into my adolescence). I see the young witch, the sweet bunny rabbit, and the blushing bride. I remember sitting with my family at my grandmother's house and dumping our loot onto the kitchen table. Our parents sat with us, judging which pieces were safe to eat and which were best reserved for older pallets. (read: they stole the good stuff) I remember posing by pumpkins and hay bales as the parents snapped pictures and made memories. However, Halloween also brings up memories closer than the six-year-old cheerleader flanked by a ghost brother and a clown cousin. I think of my first Halloween on the other side of the camera. 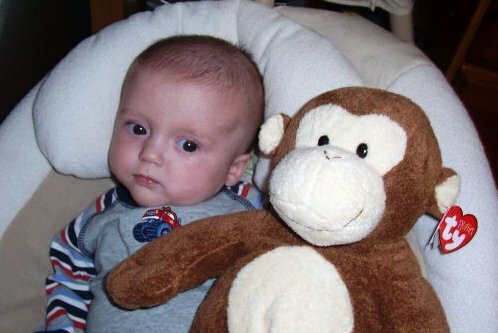 The day my oldest entered this world five Julys ago, his Aunt B gifted him with the nickname of monkey. He was weeks early and still covered in protective fuzz. His lanky arms and legs were adorable, and our monkey he was. When October arrived, the costume was ordered and my much-plumper monkey was going to live up to his nickname. Our first holiday together was amazing. My three-month-old Nathan with his long tail, round ears, and dough boy cheeks had me bursting with parental pride. I toted that baby from door to door and beamed at the oohs and ahhs waiting behind each one. His chubby fists dug deep into baskets of candy and lifted out suckers, Smarties, and chocolate like he knew what he was doing. Then, once we returned to his grandmother's house, I sat my baby on my lap and dumped his loot onto the table. I picked out what I didn't want and saved the good stuff for myself. All Nathan got was a bottle. Funny how history repeats itself. Now that my monkey is going to be a kindergarten ninja, I have a feeling I'll have to work a little harder for my treats. This post is part of an Arkansas Women Bloggers challenge called Blogtober Fest. Click to read other Halloween memories. Oh my that picture is too cute! 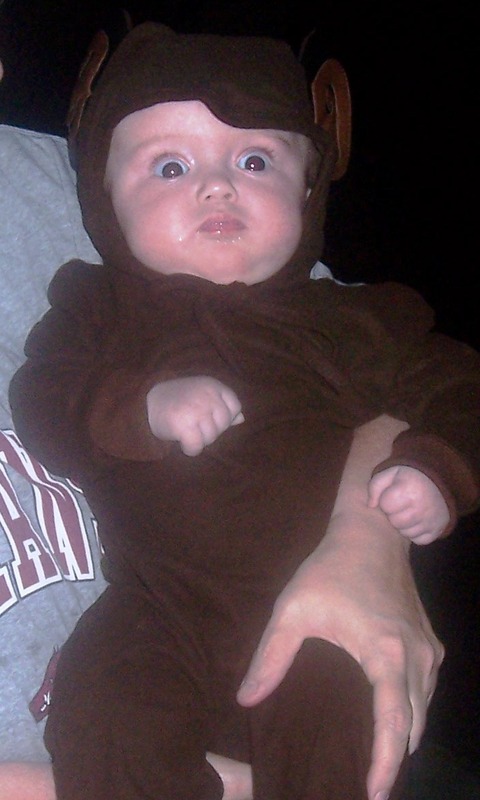 Love your little monkey pic! Super cute! Love the monkey pic! I cannot wait to take my Ladybug this year for the first time!